As Mother's Day nears, a group of seemingly-unconnected people in Atlanta come to terms with their relationships with their mothers. Sandy (Jennifer Aniston) is a divorced mother of two boys whose ex-husband has recently remarried a younger woman, Tina (Shay Mitchell). Sandy is still getting used to this when she meets Bradley (Jason Sudeikis), a former marine, in the supermarket. Bradley's wife, a Marine Lieutenant, has recently died, leaving him with their two daughters and missing her terribly. Miranda (Julia Roberts) is an accomplished author who gave up her only child Kristin (Britt Robertson) for adoption at birth; as the adult Kristin has her own daughter and mulls over marrying the father, she contemplates the missing part in her life and her friend Jesse (Kate Hudson) encourages her to search for her birthmother. Meanwhile, Jesse and her sister Gabi never see their own mother, so they're surprised when their parents suddenly show up, and plenty of catching-up is in order. Héctor Elizondo as Ramon Navarro/Lance Wallace; Credited "and as always Héctor Elizondo"
In April 2013, Dennis Dugan confirmed that he would next develop Garry Marshall's comedy film Mother's Day. On June 30, 2015, four cast members were announced, Julia Roberts, Jennifer Aniston, Kate Hudson, and Jason Sudeikis, with the film to be directed by Garry Marshall and scripted by Anya Kochoff-Romano and Lily Hollander. Brandt Andersen produced, along with Wayne Rice and Mike Karz. On July 22, 2015, Open Road Films acquired US distribution rights to the film, and it was revealed that Matt Walker and Tom Hines would co-write the script. On August 21, 2015, Ella Anderson joined the film's cast to play Vicky, Sudeikis's character's daughter. On August 26, 2015, Timothy Olyphant, Britt Robertson, Shay Mitchell, Jack Whitehall, Loni Love, and Aasif Mandvi joined the cast. On October 6, Hilary Duff was confirmed to appear, but she declined due to scheduling conflicts with filming the second season of her show Younger. Principal photography on the film began on August 18, 2015, in Atlanta, Georgia. Though shooting her part required only four days, Julia Roberts was paid $3 million. 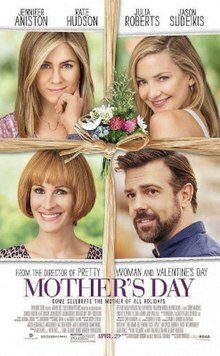 Mother's Day was released domestically on April 29, 2016 by Open Road Films. Mother's Day grossed $32.5 million in the United States and Canada, and $15.9 million in other territories, for a worldwide total of $48.4 million, against a production budget of $25 million. In the United States and Canada, pre-release tracking suggested the film would gross around $11 million from 3,035 theaters in its opening weekend, trailing fellow newcomer Keanu ($10–14 million projection) but besting Ratchet & Clank ($8–10 million projection). The film grossed $2.6 million on its first day and $8.4 million in its opening weekend, finishing 4th at the box office, behind The Jungle Book ($43.7 million), The Huntsman: Winter's War ($9.6 million), and Keanu ($9.5 million). In its second weekend the film grossed $11.1 million (an increase of 32.5%), finishing 3rd at the box office, behind Captain America: Civil War ($179.1 million) and The Jungle Book ($24.5 million). On review aggregator website Rotten Tomatoes, the film has an approval rating of 6% based on 146 reviews and an average rating of 2.9/10. The site's critical consensus reads, "Arguably well-intended yet thoroughly misguided, Mother's Day is the cinematic equivalent of a last-minute gift that only underscores its embarrassing lack of effort." On Metacritic, the film has a score of 18 out of 100 based on 30 critics, indicating "overwhelming dislike". Audiences polled by CinemaScore gave the film an average grade of "B+" on an A+ to F scale. Richard Roeper gave the film zero out of four stars, saying, "...nothing could have prepared us for the offensively stupid, shamelessly manipulative, ridiculously predictable and hopelessly dated crapfest that is Mother's Day." Peter Bradshaw, writing in The Guardian, gave the film one star out of five, calling it "as feelgood and life-affirming as a fire in an asbestos factory neighbouring a children's hospital." ^ "MOTHER'S DAY (12A)". British Board of Film Classification. April 8, 2016. Retrieved April 8, 2016. ^ "More Mowgli Moola As 'Jungle Book' Cruises Over Three Wide Entries – Box Office Preview". deadline.com. ^ a b "Mother's Day (2016)". Box Office Mojo. Retrieved June 12, 2016. ^ a b c d e f Jaafar, Ali (June 30, 2015). "Julia Roberts, Jennifer Aniston, Kate Hudson, Jason Sudeikis Anchor Garry Marshall's 'Mother's Day' Package". deadline.com. Retrieved July 1, 2015. ^ a b c d e f Hipes, Patrick (August 26, 2015). "Timothy Olyphant, Shay Mitchell & More Join 'Mother's Day' Pic". deadline.com. Retrieved September 7, 2015. ^ a b Pedersen, Erik (August 21, 2015). "Ella Anderson Joins 'Mother's Day' Cast; Cheryl Ladd Is 'Unforgettable'". deadline.com. Retrieved August 23, 2015. ^ Sztypuljak, David (April 18, 2013). "Dennis Dugan Confirms He's Developing New Year's Eve Sequel 'Mother's Day'". heyuguys.com. Retrieved July 1, 2015. ^ a b Kroll, Justin (July 22, 2015). "Open Road Acquires Garry Marshall's 'Mother's Day' Starring Julia Roberts". variety.com. Retrieved August 23, 2015. ^ "Hilary Duff integra elenco do novo filme "Mother's Day", ao lado de Jennifer Aniston e Julia Roberts". Dammit. August 26, 2015. Retrieved September 7, 2015. ^ "On the Set for 8/21/15: Eddie Redmayne Starts Fantastic Beasts, Russo Brothers Wrap Up Captain America: Civil War". ssninsider.com. August 21, 2015. Archived from the original on August 22, 2015. Retrieved August 23, 2015. ^ "'Mother's Day' filming locations in Atlanta this week". onlocationvacations.com. August 20, 2015. Retrieved August 23, 2015. ^ "Julia Roberts Made $3 Million for 4 Days on 'Mother's Day' (EXCLUSIVE)". ^ Berhoeven, Beatrice. "Disney's 'The Jungle Book' to Lead Third Weekend in a Row Ahead of 'Keanu'". TheWrap. Retrieved April 26, 2016. ^ "Mother's Day (2016)". Rotten Tomatoes. Retrieved June 25, 2016. ^ "Mother's Day reviews". Metacritic. Retrieved June 13, 2016. ^ "'Mother's Day': Stupid crapfest should be neither seen nor heard". Chicago Sun Times. Retrieved April 28, 2016. This page is based on the Wikipedia article Mother's Day (2016 film); it is used under the Creative Commons Attribution-ShareAlike 3.0 Unported License (CC-BY-SA). You may redistribute it, verbatim or modified, providing that you comply with the terms of the CC-BY-SA.